In addition to the prize money detailed below, our generous sponsor, Geoffrey Parker Games Ltd, has announced the following additional prizes for the highest placed UKBGF member in each flight. 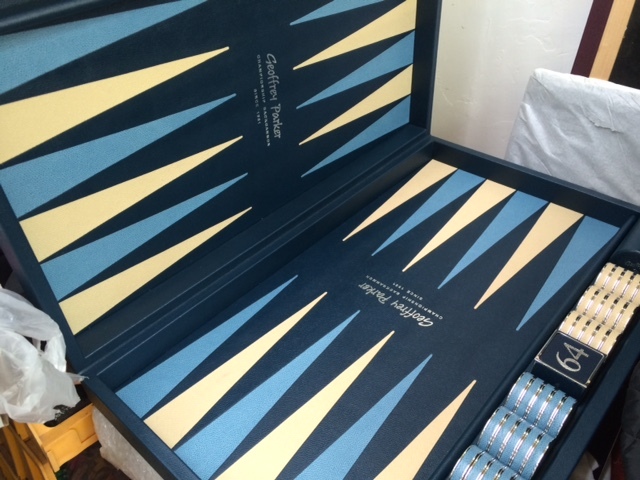 The World’s finest backgammon boards! Masters – £2000 voucher redeemable against a bespoke board of your choice. In the event of a tie (if the winner of the UK Open is not a UKBGF member and two or more members reach the same late stage of the tournament) then there will be a play-off for the board. Advanced – A £500 voucher redeemable again a Geoffrey Parker product, such as a Professional Roll-up board. Ties will be treated in the same way as for the Masters. Social Swiss – A very special UKBGF doubling cube for each winner. Only UKBGF members can win added prizes in the Masters and Intermediate flights. To be eligible you must join the UKBGF before the draw. It is no longer possible to join the UKBGF by paying cash at a tournament, so join online now using any credit or debit card to make payment. Both members and non-members are eligible to receive prizes in the Social Swiss competition. Backgammon Workshop (BGWS) is a backgammon tuition service run by Professional UK players launched in 2017 and which has helped many players to achieve great success. BGWS has generously donated a lesson each for the two UKBGF members who are the highest placed finishers in the Intermediate flight. These members must have joined the UKBGF before the tournament draw. Note that any under-18 winners will receive goods or vouchers to the appropriate value rather than cash. Total prize money for the Masters and Intermediate Flights, as well as for all side events, is the sum of all the entry fees and pools (except for satellites and jackpots – see Entry Fees). Note that satellites and 4 or 8 player jackpots are ‘Winner takes all’.